O’Donnellan & Joyce’s forthcoming auction on July 24 will commence at 10am in the Harbour Hotel, Galway, with some 50 properties going under the auction hammer. These properties have attracted exceptional interest not only locally but throughout the country. O’Donnellan & Joyce commenced its marketing campaign last week and had all 50 properties open to the public. Anne Harding, auction co-ordinator for O’Donnellan & Joyce, said she was overwhelmed with the reaction, particularly from investors outside Galway looking to acquire residential investments within close proximity of the university and the city centre, of which there are a number going into the July auction. With no return on cash, buyers are looking to acquire properties around Galway city where they are guaranteed to get a strong rental income and future growth. No 10A Newcastle Road, Galway: A very attractive five bedroom detached house in first class decorative order and condition. No 10A has 1,100sq ft of spacious, well laid out, modern, accommodation with enclosed patio yard to rear. It is being sold fully furnished. AMV is €220,000. No 86 An Creagan, Barna: A four bedroom end of terrace residence located in a well maintained estate, with southeast facing garden. This will be an ideal family home or gilt edged investment property. AMV is €260,000. No 3 Gort Na Bro, Western Distributor Road: A three bedroom semidetached residence located to the front of Millar’s Lane on the Western Distributor Road. No 3 has a northeast facing rear garden with large shed. AMV is €190,000. No 293 Tirellan Heights, Headford Road: A four bedroom semidetached residence located on the Headford Road within walking distance of Terryland Shopping Centre, schools, and church. This home is in need of some modernisation. There is off street parking to the front and a good sized garden to the rear. AMV is €170,000. No 20 Inchagoill Road, Newcastle: No 20 is an executor sale. 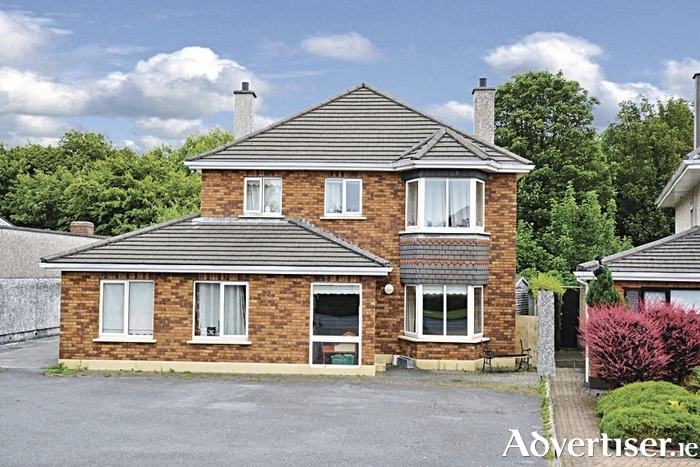 This five bedroom detached residence is within close proximity of NUIG and UHG. The property has oil fired central heating and a large east facing rear garden. AMV is €295,000. No 1 Holly Grove, Renmore: This beautifully located three bed semidetached property is in first class condition and is situated on a large corner site. This modern family home is not overlooked and boasts exceptional views over Galway Bay. AMV is €235,000. No 11 Woodhaven, Merlin Park: A superbly located seven bedroom detached residence with three en suites. No 11 is in need of extensive refurbishment. There is parking to the front for four cars, and a large rear yard with side entrance. AMV is €360,000. No 78 Glen Dara, Bishop O’Donnell Road: This fine four bedroom semidetached property is within close proximity of NUIG and UHG. The rear garden is not overlooked. The house is being sold fully furnished. AMV is €150,000. No 59 River Grove, Oranmore: This delightful three bedroom semidetached residence is located in a popular residential development. The house extends to circa 1,000sq ft and is presented in excellent condition. This would be an ideal starter home or gilt edged residential investment. AMV is €120,000. No 6 Oakfort House, Oaklands, Salthill: A lovely and bright two bed apartment located on the second floor in a small complex in the quiet residential area of Oaklands, this property is only a two minute walk to Salthill's main thoroughfare and comes with one car parking space. AMV is €145,000. No 17 Clan House, Dominick Street: This city centre apartment is located in the heart of Galway’ West End with easy access to many shops, cafés, and restaurants. Dominick Street is a short stroll away from NUIG, UHG, and Shop Street. AMV is €100,000. No 19 Lisdonagh Apts, Cuan Glas, Bishop O’Donnell Road: Lisdonagh is a modern apartment complex situated on Bishop O'Donnell Road, about 18 minutes’ walk from NUIG and UHG, with two major bus routes passing close by its doorstep. This is an ideal investment opportunity. AMV is €80,000. No 19 Mullan Mór, Tuam Road: A fine three bed duplex apartment in an excellent location close to all major industrial estates. The master bedroom is en suite and accommodation extends to circa 1,200sq ft. AMV is €130,000. No 1 Arasain Na Mara, Salthill: This superbly located three bedroom ground floor apartment offers breathtaking views of Galway Bay. Accommodation is circa 791sq ft. AMV is €145,000. No 14 Arasain Na Mara, Salthill: A spacious one bedroom second floor apartment extending to circa 457sq ft, with sea views and private parking. AMV is €110,000. No 1 Carraig Palmer, Salthill: A spacious two bedroom first floor apartment with sea views, located in the centre of Salthill directly behind the Aquarium. Accommodation is circa 681sq ft. AMV is €120,000. No 18 Galway Bay Apartments, Salthill: This open plan, bright, two bedroom apartment has a balcony offering direct views onto Salthill Promenade and Galway Bay. AMV is €125,000. No 29 Ambra House, Woodquay: A city centre two bedroom apartment presented in good condition, located within walking distance of Eyre Square and all local amenities. AMV is €120,000. No 9 The Elms, College Road: This two bedroom ground floor apartment with own door entrance comes with communal parking and is located within moments’ walk of Eyre Square and all local amenities. AMV is €195,000. No 12 Sailin, Wellpark: This modern two bedroom third floor apartment is located directly off the main Galway/Dublin road immediately adjacent to the g Hotel. No 12 would be an ideal starter home or a gilt edged investment property. AMV is €120,000. Block D, Clifden Court, Clifden: This lot comprises four individual ground floor commercial units located in part of a modern commercial and residential development. All units have been fully fitted out to include electric central heating, alarm systems, and suspended ceilings. Each unit has its own individual entrance. AMV is €50,000. Unit 5/6 Kilkerrin Park, Tuam Road, Galway: A first floor office unit of 1,500sq ft located between the Headford Road and the Tuam Road, neighbouring Liosban Industrial Estate, Ulster Bank, and AIB. The unit is located in a busy retail park within a five minute drive of Galway city centre. AMV is €40,000. Unit 14 Temple Jarlath Court, Tuam: A ground floor commercial unit presented in shell and core condition, located in Tuam town centre next door to Tuam Shopping Centre. Accommodation is circa 700sq ft. AMV is €50,000. Apt 19 Temple Jarlath Court, Tuam: A modern two bedroom first floor apartment with balcony, located in Tuam town centre in a secure gated complex. Accommodation is circa 620sq ft. AMV is €50,000. No 3 Altan, Western Distributor Road: A spacious and well maintained three bedroom first floor apartment, located in a secure complex within walking distance of Knocknacarra Retail Park, several pubs and restaurants, hotels, and primary and secondary schools. This is an ideal starter home or gilt edged investment property. AMV is €110,000. No 73 Cois Na hAbhainn, Ballygaddy Road, Tuam: A modern three bedroom semidetached residence, located within walking distance of Tuam town centre. Accommodation is circa 910sq ft. AMV is €75,000. Also going up for auction on the day are properties in the city centre, Barna, Salthill, Western Distributor Road, Monivea, Connemara, Tuam, Mayo, and Roscommon. Page generated in 0.1368 seconds.